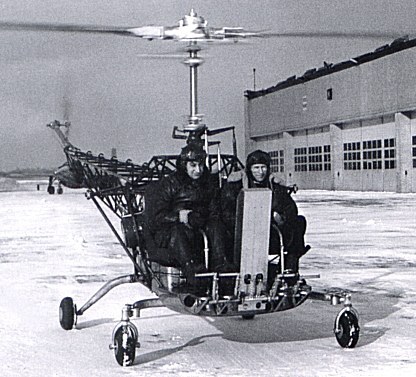 Experimental single-seat helicopter with open frame fuselage structure (later enclosed), pilot seat in nose, three-leg tailwheel u/c and 160hp Franklin engine mounted in centre section driving tail rotor and 2-blade wooden main rotor with transverse stabilising bar. Prot. NX41867 FF 29 Dec. 1942 subsequently rebuilt with monocoque fuselage. Second prot. NX41868 with two seats and enclosed cabin. Third prot. NX41860 with open cockpit and revised tailboom structure. 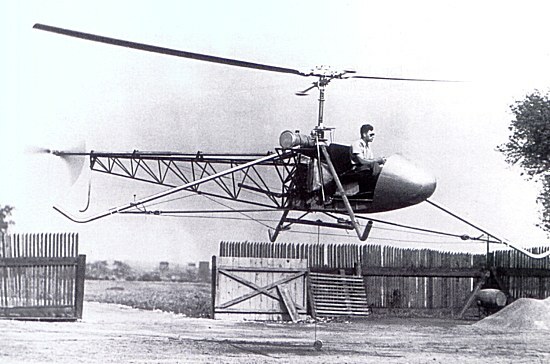 By the autumn of 1941, Arthur M Young had been testing helicopter scale-models on his farm in Pennsylvania for some thirteen years. After this period of research, many failures and his big breakthrough with the invention of the stabiliser bar, Young had perfected a design that would appeal to a manufacturer. Young's first attempts at interesting aircraft companies in his machine met with little enthusiasm until one of his friends visited Bell's factory. This led to an appointment for a demonstration on 3 September, 1941. Larry Bell and Arthur Young reached an agreement in due course and, on 24 November, 1941, Young and his assistant, Bart Kelley, arrived at Bell to supervise the initial building of two prototypes as specified in the contract. On 23 June, 1942, Young and his team (some fifteen people) were installed in an old Chrysler agency and garage in Gardenville, a suburb of Buffalo. Dave Forman was assigned to supervise the project. The Model 30, as it was known inside the company, was a rather crude structure made of welded tubes with a wide four-legged undercarriage made of 3in aluminium tubing. The engine, a 160hp Franklin six-cylinder horizontally-opposed air-cooled unit was mounted vertically behind the cockpit within a steel-tube framework. The main two-blade rotor hub was mounted on a transmission mast by universal joint and was provided with a stabilising bar below and at right angles to the blades which were rigidly connected to the hub. This bar acted as a flywheel on a hinge. 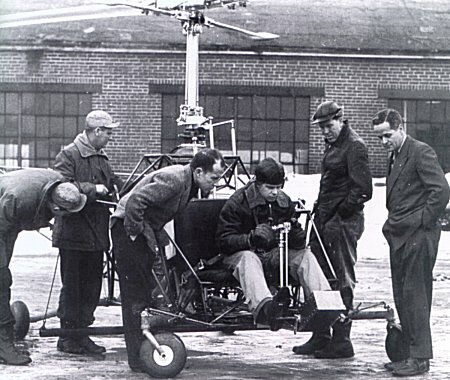 It kept the rotor blades level and independent from the movements of the fuselage, solving the problem of stability. 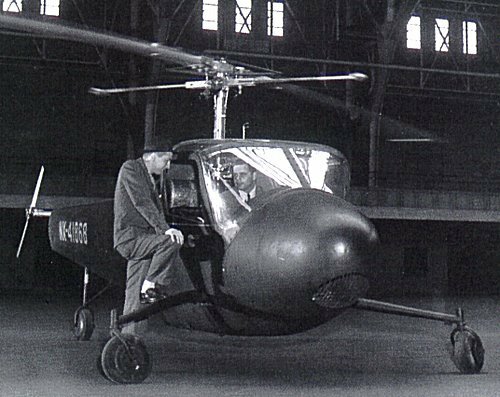 The main rotor drive was done through a centrifugal clutch and a two-stage planetary transmission with a 9:1 reduction ratio. The blades, of symmetrical aerofoil section, were made of solid wood with a steel insert in the leading edge. 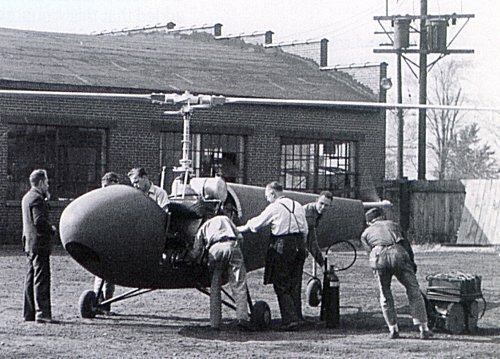 The two-blade tail rotor (also made of solid wood) was mounted on a thin tube at the end of the fuselage. The roll-out of the first Model 30 (c/n 1, later to be registered NX41867) took place on 24 December, 1942; a secretary broke a bottle of champagne on the fuselage and the aircraft was named Genevieve. On this day, the engine was run up at 150rpm. The maiden flight occurred on 29 December when Young flew the tethered Model 30 at an altitude of 1.5m; the same day Floyd Carlson also flew the aircraft. Early in January 1943, the prototype was victim of an accident and its pilot, Bob Stanley, was badly hurt. The aircraft was repaired and on 26 June, 1943, the cable was removed and Carlson took Genevieve on its first free flight. The aircraft performed well and by July 1943 was flying at speeds of over 110km/h. At this time, a three-wheeled undercarriage was installed, the fuselage was covered and the aircraft was painted blue overall, so that it could be used for demonstration flights. While flights of the Model 30 No.1 were underway, aircraft No.2 was being built. Several modifications were introduced in this machine: new undercarriage, semi-monocoque fuselage and new tail rotor mounting, but the most noticeable change was the enclosed cockpit, with car-like doors, for the pilot and one passenger. Unfortunately a setback occurred in September 1943 when the No.1 crashed with Carlson at the controls. Carlson was unhurt but the badly damaged aircraft had to be rebuilt. It was flying again within six months. Thus, in late September 1943, aircraft No.2 (registered NX41868) replaced No.1 as the test vehicle. One of the first passengers to fly in this aircraft was Larry Bell. In 1944, Bell began a demonstration programme with aircraft No.2 which made its public debut in March 1944. On 10 May, Floyd Carlson flew the aircraft indoors in a Buffalo armoury before Civil Air Patrol pilots and cadets. By the spring of 1944, aircraft No.1 had been rebuilt and was designated No.1A. Making a spectacular come-back, this helicopter was the star attraction at a soldier's benefit show, staged at Buffalo's Civil Stadium on 4 July. On 5 January, 1945 the first rescue mission ever made by a Bell helicopter took place when Jack Woolams baled out of a P-59 Airacomet in trouble near Lockport. Floyd Carlson and Dr. Thomas C. Marriott took off in one of the Model 30s and, guided by Joe Masham flying a P-59, rescued the unfortunate pilot. But the first publicized rescue mission took place two months later, on 14 March, when two ice fishermen were rescued on Lake Erie. Carlson received the Treasury Department Silver Medal for this daring feat. Meanwhile, the construction of a third aircraft had begun. Among the several improvements introduced on this machine were a four-wheel undercarriage, an advanced instrument panel and a tubular tailboom, but it retained the open cockpit of No.1. 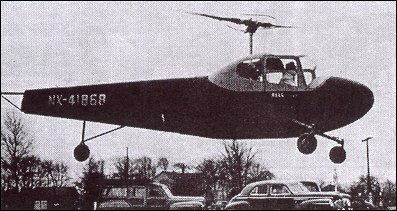 This helicopter (c/n 3, registered NX41869) flew for the first time on 25 April, 1945, and performed well, so well that it proved to be the best of the trio to demonstrate, but the open cockpit was a real handicap. To overcome this Young had the idea of covering the cockpit with a Plexiglass bubble thus providing both comfort and outstanding visibility for pilot and passenger. The shape of this aircraft was now very near to that of the Model 47. Two of the Model 30s are still in existence: c/n 1A (NX41867) is on display at the National Air and Space Museum and c/n 3 (NX41869) is owned by Buffalo and Erie County Historical Society Museum, Amhurst, New York. Pilot Floyd Carlson familiarizes himself with the tethered Model 30 behind the Gardenville facility. Inventor Arthur Younh (center) walks Ship 1 out of the workshop. This first Model 30 has been revised with stiffened rotor components, a wheeled landing gear, and fabric covering painted dark blue with yellow trim. Model 30, Ship 1, being readied for a flight in the backyard of the Gardenville development facility. Wheels replaced by the spider landing gear after free-flights were well along. 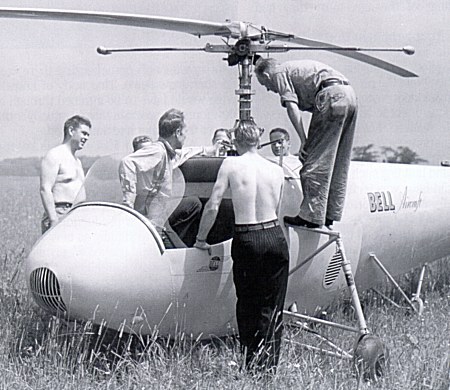 Rebuilt after it crashed in September, 1943, the first Bell helicopter was redesignated Ship 1A. Modified landing gear had tail wheel moved closer to the rotor hub. 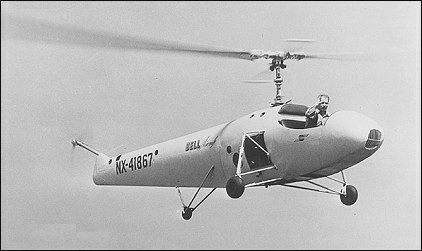 Model 30, Ship 1A, the original Bell helicopter was rebuilt and redesignated after its crash during an autorotational landing in 1943. 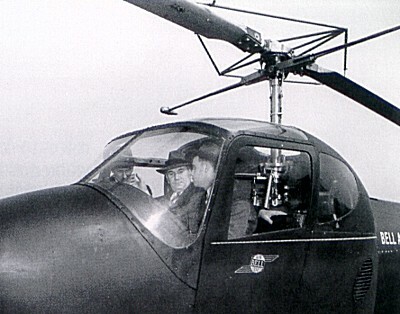 Floyd Carlson is seated in the helicopter, with Arthur Young to his immediate right, leaning over. Floyd Carlson hovers Ship 1A, while Arthur Young looks on. 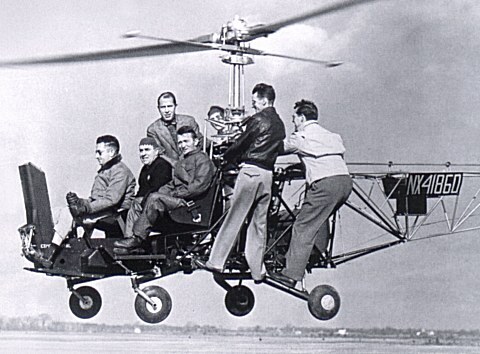 The helicopter was rebuilt from the original Ship 1, with a redesigned landing gear and modified tail rotor shaft. 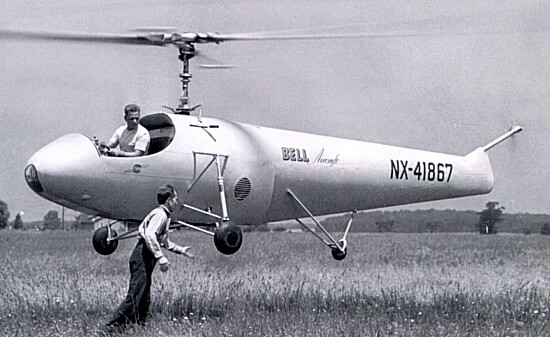 Model 30, Ship 1A, the original Bell helicopter, was fitted with this experimental agricultural spray rig for early aerial application tests. 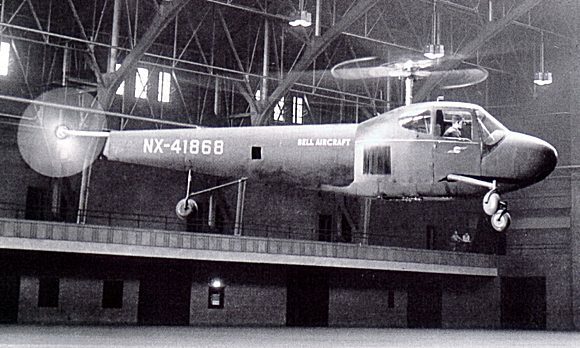 Model 30, Ship 2, being readied for the first ever public demonstration of a Bell Helicopter inside Buffalo's 65th Regiment Armory. Floyd Carlson, in cockpit, is talking to Arthur Young, standing. Featuring an enclosed cockpit with seating for two, the second Model 30 flew in September 1943 and made this indoor demonstration at a Buffalo armory in May 1944. Larry Bell sits in the cockpit of Model 30, Ship 2, possibly before his first flight in late 1943 or early 1944. 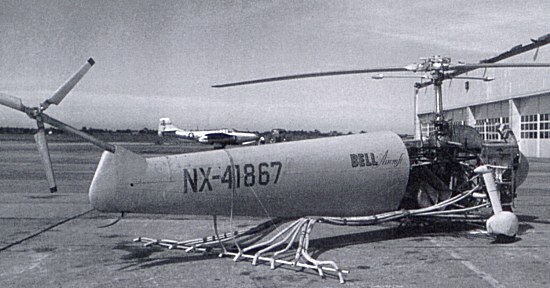 Bell Model 30, Ship 3, the unauthorized helicopter which became the basis for the Model 47, is on the ground at Niagara Falls. Model 30, Ship 3, slightly modified for this flight, carries seven persons in a demonstration flight. Pilot is Joe Mashman and Arthur Young is standing on far side, facing camera. My dad, Marshal Parsons (AKA M. L. Parsons), was also at Bell at this time. I was told that her worked on and possibly even flew Bell's first helicopter. I am curious to see if anyone can find some photos with him in them. I'm not even sure if I would recognize him that much younger since he was 46 when I was born. I know that my mom has a few photos. One (or a few) of them is a of a crash site, in the snow. Not sure if I can get ahold of them or not. I will ask her the next time I visit. Hello. Am doing research on Bell Test Pilots. Does anyone have a photograph of Frank E. "Bud" Kelley. I understand he flew the Model 30 and later the Bell Jet XP-59. Thank you. My name is Chris Aultman and I work for Helistream inc. We have a small collection of early bell photos like the ones listed here but we need to replace them and are looking for more material. We got most of ours from our friend Doug Daigle, the owner of the last fly Bell 47B, now in the Smithsonian, which used to be based here. The wall is a tribute to him. Any help you can provide would be most appreciated. If you are interested, please contact me and tell me who you are. I am Floyd Carlson's son. I have some additional material, suchas a short film of the autorotaion crash. If you are interested, please contact me and tell me who you are.